Woot! Woot! Its time for another Neat & Tangled release! Are you ready? Lots of gorgeous inspiration, lots of fabulous products and giveaways too! I have been a Neat & Tangled Design Team member for almost 2 years now and I have to say – designs just keep getting better and better! 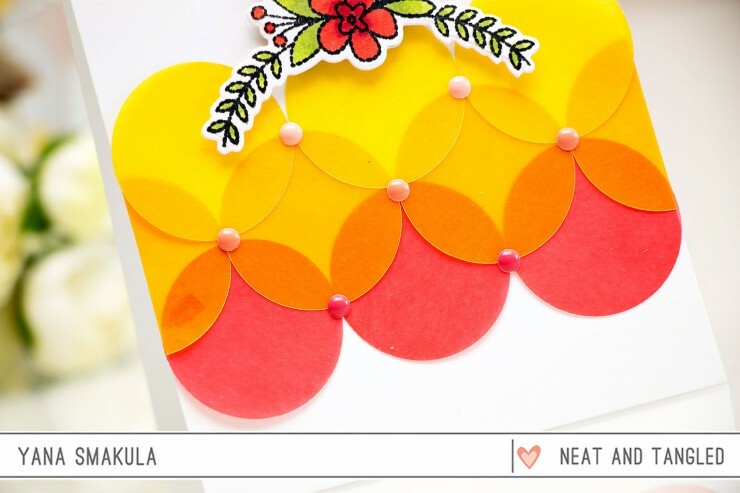 Aside from stamps Neat & Tangled is also introducing colorful vellum circles (there are 3 sets with 3 colors/sizes each). These are great to be used as little accents on cards or to create backgrounds. If you’ve been following me for some time you might remember this card and video of mine where I used a circle stamp to create colorful backgrounds. I re-visited that idea today and created an identical background using vellum circles! It was much easier and quicker task, the only trouble I had was with adhering them down. I used enamel dots to adhere the circles together and than hid little glue dots behind the enamel dots to adhere them down onto my card. Here’s a look at the vellum circles sets – there are a lot of circles in the pack, enough to make several backgrounds like this (I’ve used the largest size for this background). I’ve used a few more new products to create this card; the beautiful floral die cut was created using the Hand Stitched stamps and dies and the sentiment is from My Sunshine set, which is a July/August 2015 You’re So Neat Incentive Stamp Set. You can read more about it here. Love your cards! I especially love what you’ve done with the vellum circles! Just loving the partially inked background, so effective and those overlapping vellum circles look AMAZING! I don’t know what kind of animal that is but it sure is cute. 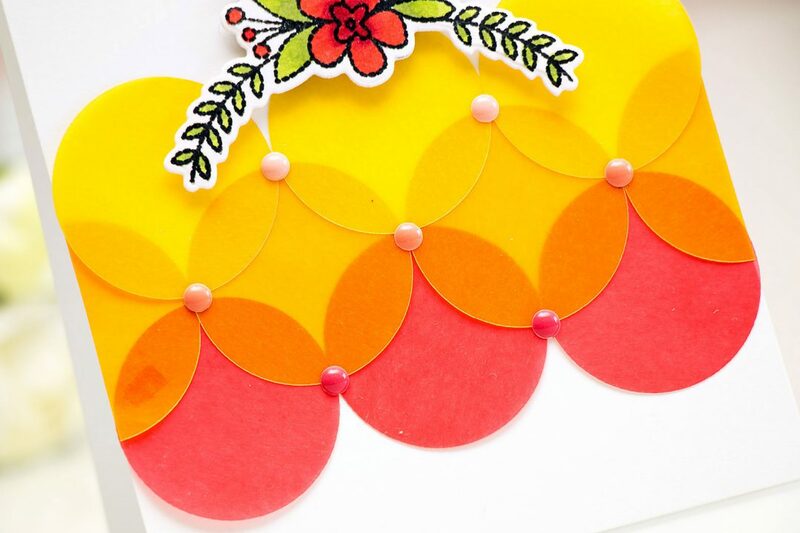 The vellum circle card is very colorful and clever. Great job and thank you. Oh my.. This geometric background… On my wish list! And vellum circles are so fun!! thank you, darling! I’m in love with the vellum circles, so many possibilities using these! Gosh, these are both fabulous Yana! The colored vellum circles are so unique and fun, I love the final look so much! And the dog, that makes me smile! it is such a cute card and I love the geometric background that you added for some subtle texture! thank you so much, Nina-Marie! So glad you liked these! Hugs! Two absolutely fantastic cards! Love how one is so fun and whimsical and the other is so elegant and pretty! That dog is so cute! Love your cards! woof woof 🙂 thank you! LOve all your cards,but these are rspecially great,so as the stamps!